We love having an office in San Francisco because we can chill out with our native SF Savior of Sound, Mark Farina. We got a chance to pick his brain and he shared his awesome taste in music with us. The father of “mushroom jazz,” Mark served up some jazz knowledge and a killer summer playlist. So throw on your favorite SOL REPUBLIC headphones and have a listen. SR: It’s always fun to imagine crazy or impossible musical combinations. So if you could collaborate with any artist, dead or alive, who would it be? SR: We want to know what you’re listening to, so give us your Top 5 songs of all time. Choose wisely. SR: What originally got you into DJing? MF: This club called Medusa in Chicago around 1985 is the spot that got me into DJing. I met a DJ there named Terry Martin and started hanging out in the DJ booth. SR: And who are some artists that you’re really into right now? MF: A couple of them are Detroit Swindle, Late Night Tuff Guy, Dave Alison, Homero Espinosa, and Jazz Spastics. SR: Got anything particularly interesting on your Tech and hospitality rider? MF: Hard to compete with Steve Aoki’s rider. Lol. Bottle of scotch or vodka and 3 white hand towels. SR: Now that electronic music is on the rise, where do you think House music is going from here? MF: House is always moving forwards and backwards. New great sounds by young artists and new generations of kids getting into it…and an appreciation and reverting back to the simple early tracks/styles of house music. SR: What are you working on right now? We’re excited to see what’s next for you. MF: New Great Lakes Audio projects include Mikey V., Demiur, Freaky Behaviour and Lil Mark. Also Mushroom Jazz 8 in the works. SR: What’s the craziest memory you have from behind the scenes at a show? Let us live vicariously through you. MF: Hanging out with Grace Jones after gig in Zagreb, Croatia around 2001. Chilling in her hotel suite with a grand piano while she’s playing and singing at dawn. SR: Everyone has their own way of getting psyched, like breathing exercises or a pump-up song. Do you have any pre-show rituals? MF: Listening to beats in the hotel room watching ESPN. SR: How would you describe your sound in two words? 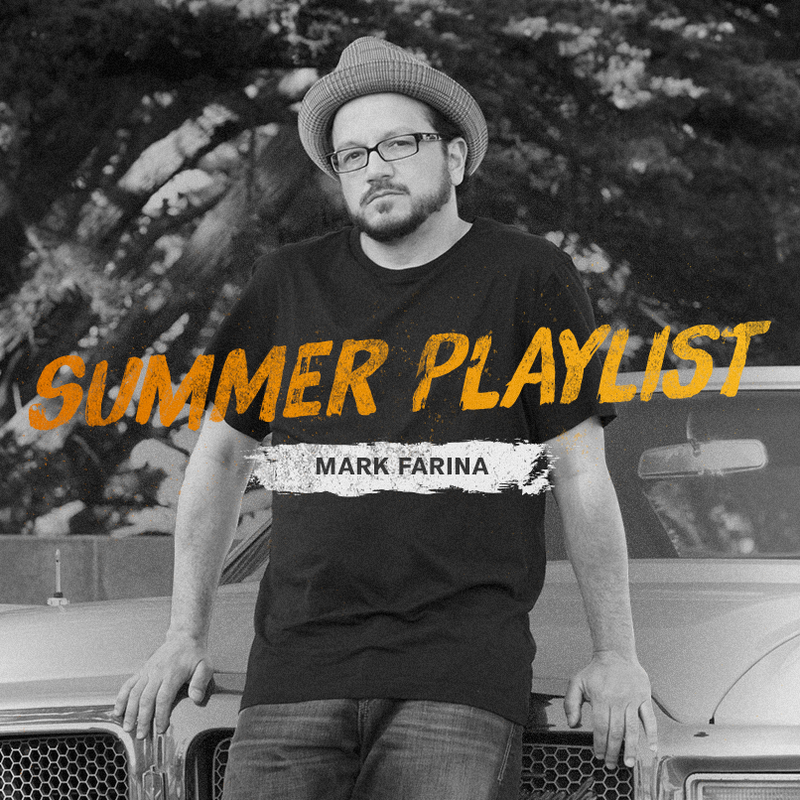 SR: What does a day in the life with Mark Farina look like? MF: Have 2 different lives at the moment. When home…up everyday at 7am making breakfast for my son Dylan then exploring playgrounds in SF. On tour…get to sleep a little later, finding new/old record stores in every city. Then using Yelp to find good food. SR: Hope you’re having fun on tour! Where will you be playing next? MF: This weekend is London Saturday for the Lovebox after party. Then Tomorrowland in Belgium on the Derrick Carter & friends stage with dj sneak back 2 back session. SR: Any advice for upcoming artists trying to make it? MF: Record your home sets (or live) and post on SoundCloud. Make tracks. SR: With the music industry getting bigger and more muddled every day, it’s important to stay unique, so how do you set yourself apart from all the others? MF: Using the web to promote images and ideas. Soundcloud, twitter, and Instagram are my faves. I try and make Instagram a living art project of my travels. SR: Technology is advancing every day and making it easier for people to make music from their bedrooms. In your opinion, is that a good or bad thing? MF: It’s great! Over the past 25 years, the ‘barriers’ of making a great track have been broken down from having larger /expensive studio set up to an affordable and portable home set up. A great tune can come from anywhere. But on the flip side…there can be a lot of crap out there too. SR: As an experience Yelper, what’s your favorite place to eat in SF? We’re always looking for new local spots. MF: So many great spots in SF. SOMA streat food is a cool spot with rotating food trucks daily. SR: How do you unwind while on tour? MF: Watch the Weather Channel and listen to nice beats. Check out a used record store, have a nice meal. Great producer from Montreal, Dave Alison’s label that puts out serious new disco consistently continues to push the boundaries of deep disco funk infused goodness. SoCal DJ/Producer brings more heat on his own label with his jazzy keys laden smooth jacker. This Jamiroquai cover gets a mystery reis that brings the great combo of artists on to the dance floor! Forthcoming GLA release brings ascending artist, Demuir Pierre, to the family with rolling drums and subtle, Amel Larrieux samples textured over driving bass. Philadelphia label continues to shine with this deep track sampling the classic, Barbara Ann Teer spoken word album, bringing the vocals to new heights. Hot artists, Hapkido, brings another jazz infused stormer with sweet sax riffs, dope samples and a lil extra sumthin! Dutch duo making waves in the Deep House scene with this wonderful track featuring Mayer Hawthorne on vocals — Deep goodness!